The QuixX Pulsed Diode Module is a turn-key diode module with integrated driver and TEC designed for applications such as FLIM, Fluorescence Microscopy and TCSPC. 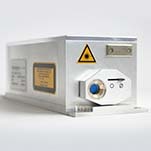 The Pilas Pulsed Diode system has a separate controller and Laser head. With short pulses and low timing jitter the system is ideal for detector calibration and testing.